iCloud Tabs was rolled out in OS X Mountain Lion and works with any iCloud-enabled iOS device running iOS 6 or higher. The iCloud service syncs your open tabs across your iOS and OS X devices, allowing you to access your iOS browser tabs from Safari on the Mac. It also works in the opposite direction by displaying open Safari for Mac tabs on your iOS device. iCloud Tabs is a convenient feature for Mac Safari users, but it is not compatible with Chrome or Firefox for the Mac. If you use an alternative web browser, you need a third-party tool like CloudyTabs to view your open iOS tabs. CloudyTabs compiles the existing iCloud Tab information from OS X and does not require you to enter in your iCloud credentials. 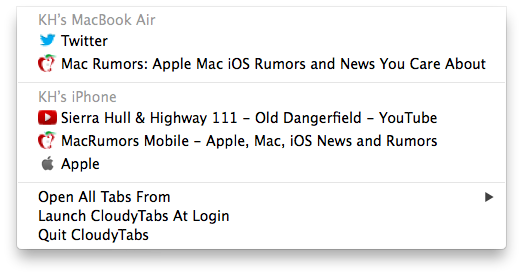 Just like the official iCloud version, CloudyTabs breaks down your open tabs by device, allowing you to see what you have open on your iPad, iPhone and other Macs. Tapping on a tab in the menu bar app will open the URL in your selected browser. You can open tabs individually or choose to open all tabs from a chosen device. Unlike iCloud Tabs which shares between iOS and OS X, CloudyTabs only works in one direction (iOS to Mac) and does not share your open Chrome or Firefox tabs on your iOS device. If you need bidirectional sharing, you must use iCloud Tabs with Safari on the Mac or switch to Chrome, which can share bookmarks between Chrome for the Mac and Chrome for iOS [Direct Link]. CloudyTabs is open source and available for free to download from Github. Icon looks too similar to cloudapp. In fact, the shape is the same, they just removed the black foreground color. It feels weird that I have two cloud icons on my menu bar. Can someone explain the mechanics of how this works without using my iCloud credentials? Are my tabs visible publicly through some iCloud API? Edit: Looks like it just inspects a .plist file on your Mac that iCloud handles if you've already signed in on your system. I'm surprised Apple didn't encrypt it to make sure you're locked into using Safari. PS - Also my... FIRST! first. I'd kill for a way to be able to open my Firefox tabs in mobile Safari. I can't think of one instance where I've wanted to open an iOS tab on my Mac, but I often stumble across articles while browsing on my Mac and want to kick back and read them on my iPad. YES. I've wanted this for so long. Thank you, dev!